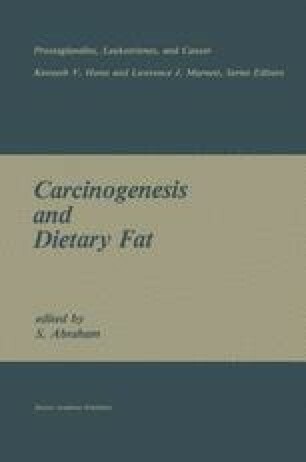 Deficiencies or excesses of certain dietary fats have been shown to influence tumorigenesis at select sites. In a similar manner, diets which are deficient in essential fatty acid(s) (EFA) or which contain a high level of fat may influence some components of the immune response. Fatty acids added to lymphocytes or macrophages in culture have been shown to influence immune function (reviewed in 1). However, both enhancement and suppression of T- and B-cell responses have been demonstrated depending on how fatty acids were introduced into culture (reviewed in 2). Based on in vitro fatty acid manipulation, it has been hypothesized that polyunsaturated fatty acids (PUFA) take part in immunoregulatory mechanisms and that the concentration of these fatty acids could influence the interaction of lipids and binding glycoproteins within the membrane of cells involved in immune response (2). However, changes in immune response after manipulation of fatty acids in vitro may or may not relate to changes of immune function in vivo because of the complexity of cell interactions and regulatory products produced.